The global automotive intake manifold market is highly fragmented in nature, thanks to the existence of a large number of players operating in it, states a market research study by Transparency Market Research. The prominent players in the market are making efforts to enhance their market presence and attract a large number of consumers in the coming few years. Some of the prominent players operating in the automotive intake manifold market across the globe are MAHLE GmbH, Mann+Hummel Group, Aisin Seiki Co., Ltd., Röchling Group, and Magneti Marelli S.p.A. The rising number of mergers and acquisitions and the rising emphasis on innovations are likely to accelerate the growth of the global automotive intake manifold market in the near future. According to the research study by Transparency Market Research, in 2015, the global market for automotive intake manifold was worth US$42.7 bn. The market is likely to reach a value of US$58.7 bn by the end of 2024, exhibiting a healthy 3.60% CAGR between 2016 and 2024. From a geographical point of view, in 2015, Asia Pacific held a key share of the global automotive intake manifold market and is likely to retain its leading position in the coming few years. The introduction of new and innovative products and technological advancements in this field is estimated to fuel the growth of the Asia Pacific market in the forecast period. In addition, the rising investments in the automotive sector and the tremendously rising number of vehicles are predicted to accelerate the growth of the market. Furthermore, Europe is expected to experience a healthy growth, thanks to the presence of several players operating in this region. On the basis of material type, the global automotive intake manifold market has been divided into plastic, aluminum, and composites. As per the research study, the aluminum segment is expected to lead the global market in the next few years. The rising preference of manufacturers as it is comparatively lightweight and reduces the chances of rusting are some of the key aspects that are boosting the demand for aluminum in the global market. On the other hand, the composites segment is projected to exhibit a significant growth rate throughout the forecast period. A substantial rise in the vehicle production across the globe and the stringent government rules and regulations are some of the major factors that are expected to fuel the growth of the global automotive intake manifold market in the next few years. In addition, the rising government initiatives in order to reduce the weight of vehicles so as to make them more efficient in terms of fuel requirement is projected to supplement the growth of the overall market in the coming few years. Furthermore, the rising disposable income of consumers in developing economies and the improving living standards are indirectly predicted to fuel the growth of the overall market in the forecast period. 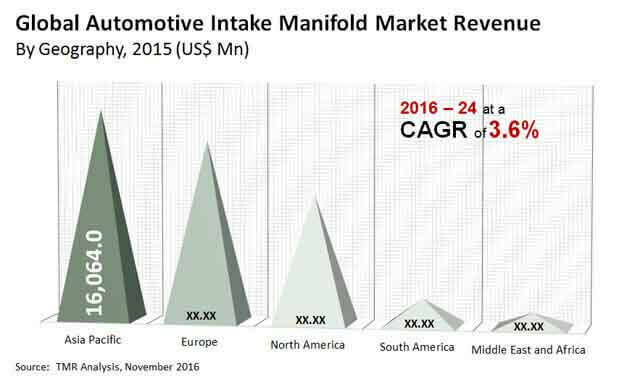 The global market for automotive intake manifold, on the flip side, is projected to witness several challenges in the near future. The fluctuating prices of raw materials are anticipated to restrict the growth of the global market in the next few years. Nevertheless, the rising contribution from China and India is predicted to generate promising opportunities for key players in the market. Moreover, the increasing number of players entering the market is likely to supplement the growth of the overall market in the near future.